When the Vikings traveled the North Atlantic, over 1000 year ago, they relied on the local herb angelica, with its high content of Vitamin C, to prevent them dying of scurvy. 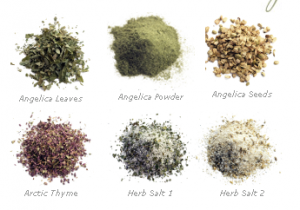 The folks behind Kvann Kompagniet realized that the tradition around herbs like angelica was falling away, and they wanted to offer cultural authentic herbs, plants and products from the entire Arctic. Their model simultaneously allows isolated communities and places to advertise their unique identity and character through products that are vital to them on a daily basis.